Presair, the leading manufacturer in pneumatic switching technology, released a pressure monitor providing a low cost solution to original equipment manufacturers and facilities worldwide. The pressure monitor provides notification and prevents issues before downtime occurs. Versions tailored to meet the needs of manufactures, the monitor notifies personnel using visual, audio and even text alerts when air pressure rises or falls in a system. Presair’s pressure monitor is a simple, economical solution without all the complicated components of a programmable logical controller. Other pressure monitoring devices incur a high cost upwards of a thousand dollars or more. Companies have quickly found the value of a pressure monitor by increasing uptime resulting in higher productivity. Installing the pressure monitor is as simple as connecting the switch to the pressure source and plugging the notification device into a 120V outlet. 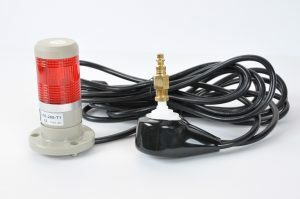 The pressure monitor includes an adjustable or factory set air pressure switch (UL approved) ranging from 1 to 125 pounds per square inch07 (psi), a red stack light, and an optional audible alarm. Additionally, we also tied this application into another product of ours, Nanospark. By connecting our airline monitor to Nanospark, we’re able to receive text and email notifications, as well as see historical reporting when the airline pressure was down. The Presair product line consists of air, pressure and vacuum switches, along with push button actuators and foot pedals, for commercial and residential use. These devices use a change in air pressure to precisely trigger at a specified vacuum or pressure level range of electrical switches up to 25A 250VAC. Using air to trigger the electrical switch allows the more dangerous electrical system to be fully isolated from hazardous environments. This makes the actuators waterproof, shock proof, and explosion proof. For more information about the Presair pressure monitor or to purchase, visit our website www.presair.com. About Presair, a division of Senasys Inc.
Presair was founded in 1974 and has enjoyed many years as a successful manufacturer of pneumatic switching and controls. The Presair product line was acquired by Senasys in 2014. The company manufactures quality-engineered air, pressure and vacuum switches used in a wide range of applications from pool/spa to medical instrumentation. The business has grown over the years by developing new product lines in-house as well as acquiring complimentary and related components.